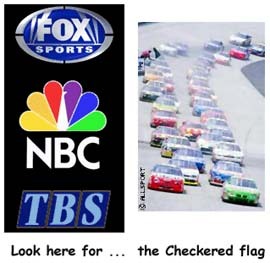 NEW YORK (CNNfn) - Television networks NBC and Fox and cable channel TBS won the rights to televise NASCAR car races, a deal valued at about $400 million a year for six years. As part of the agreements, Fox and its FX cable affiliate will have the right to broadcast the first half of NASCAR's 36-week season, while NBC and TBS will divide up the second half. Fox is a division of News Corp. (NWS), NBC is owned by General Electric (GE) and TBS is a unit of Time Warner (TWX), which also owns CNNfn. In the deal, NBC and TBS will form a joint venture that expands upon their cross-promotion relationship for National Basketball Association game coverage. NASCAR did not specify the value of the deals, which take effect in 2001. But people familiar with the transactions confirmed reports the deals will be worth about $400 million per year. That's more than four times what the stock-car race operator collects each year in current deals. Fox's deal lasts eight years, and the NBC/TBS pact is for six years. NASCAR has been enjoying heady success in recent years, with attendance jumping 90 percent since 1990, network TV ratings up 19 percent since 1994, and retail sales of race-related paraphernalia up a stunning 1,100 percent since 1990. For the TV networks, sports have become an increasingly important way to generate advertising revenue and promote other programming. NASCAR is the only major sport that has shown growth each year of the 1990s, company executives said. Executives said that increasing exposure to the sport, rather than the money packages, was their top priority in awarding the broadcast rights. During a conference call, they cited, for example, the solid NBC Thursday night programming line-up as a good way to promote NASCAR's weekend races. "This agreement will showcase NASCAR racing to millions of sports fans like never before, providing fans with an interactive experience and bringing them closer to NASCAR in ways they could have never imagined," said Bill France, NASCAR's president. Vince Wladika of Fox said the first half of the NASCAR season, which begins in February, is worth more because it does not conflict with the National Football League season schedule. Because the first half of the NASCAR season is more valuable, Fox would pay about 55 percent of the $400 million total, while TBS/NBC would pay for about 45 percent, company officials said. Other bidders included CBS Corp. (CBS), which has aired the Daytona 500, the sport's best-known event, since 1979, and Disney (DIS), parent of the ABC network and cable's ESPN sports network, and The Nashville Network cable channel. In a statement, CBS Cable, the cable division of CBS, expressed disappointment: "As an original cable home of NASCAR, we are very disappointed with this decision. However, we feel that CBS and TNN made a very competitive bid on these rights." As part of the new bidding process, all of the networks with existing contracts agreed to hand over those rights, NASCAR said. CBS will still air the Daytona 500 in 2000. Starting in 2001, NBC will broadcast the Daytona 500 in three even-numbered years; Fox will televise it for four odd-numbered years.